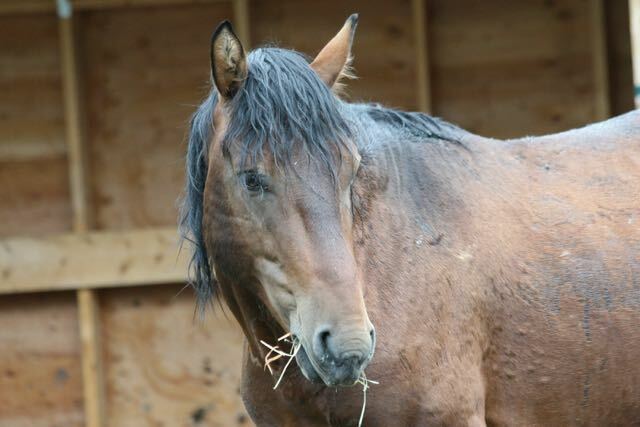 WHOAS continues to respond to complaints where the wild horse stallions are causing problems to private land owners. Usually these boys are trying to break into where land owners have mares and steal them for themselves. Unfortunately efforts such as changing them back onto the forestry or fixing fences do not always work. In the past a lot of times you know where these horses would have ended up. Now, however, more property owners are calling upon WHOAS to help out with these types of situations. We would rather see them running free and wild, but at least now can offer another solution which is adoption. 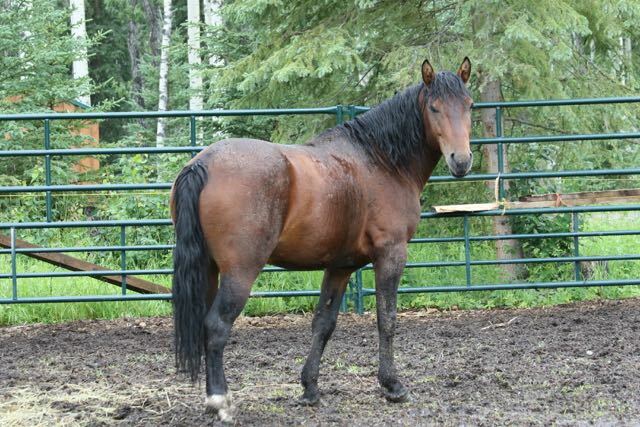 Buster is a rescued Alberta Mountain Horse. WHOAS took him in and have been working with the boy gentling him down, gaining his trust and he is also halter broken. He is around 14-141/2 hands high and with of course, excellent feet. These wild horses once trained have proven over and over again, to be remarkable trail horses. They are very sure-footed, level-headed and strong with excellent endurance. He has been gelded, wolf teeth removed, dewormed and vaccinated. If you are interested, please contact us to arrange a visit. 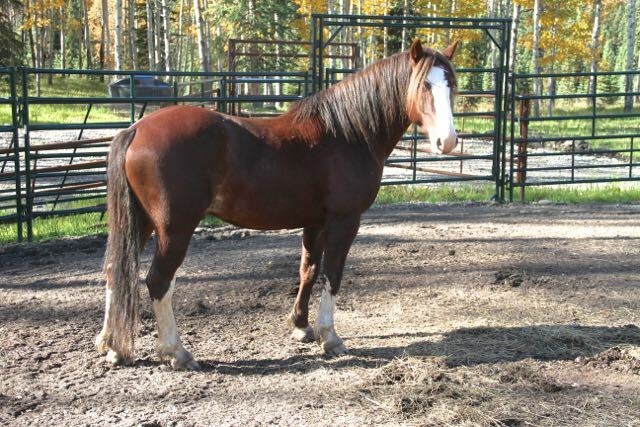 The adoption fee helps recover some of the costs in our saving these horses. 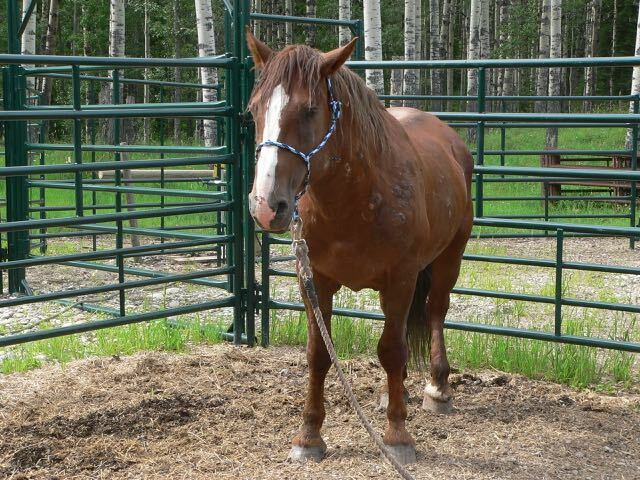 Here is Bandit who was very determined young boy who had managed to get into a pen of the landowner’s registered Paint mares. He is about 5 yrs. old and 14 hands high. He has been gelded, wolf teeth removed, dewormed and vaccinated. He has progressed extremely well in his gentling process and shows great promise. Baxter has been featured here before and is the old boy, about 15+ years old. He has had a tough life in the wild but is now thriving with our care and attention. He has also responded well to the gentling process. He has been gelded, wolf teeth removed, dewormed and vaccinated. We believe that Baxter would make an excellent companion pasture horse where he would be able to live out his life in peace. Our hope is that we find this type of loving home for him. If you are truly interested,we stress the importance of visiting us and getting hands-on experience with the horse you may want to adopt. To arrange a visit please email us. I am so touched and sad to see what happens to any of these great creatures of God who have been used by men for thousands of years. Somehow this year, I’ve developed an enormous appreciation of horses and I want to help any organization who will help them.